We French have a bad reputation. People all over the world think we’re arrogant and rude, but I’d vouch that we’re just misunderstood. 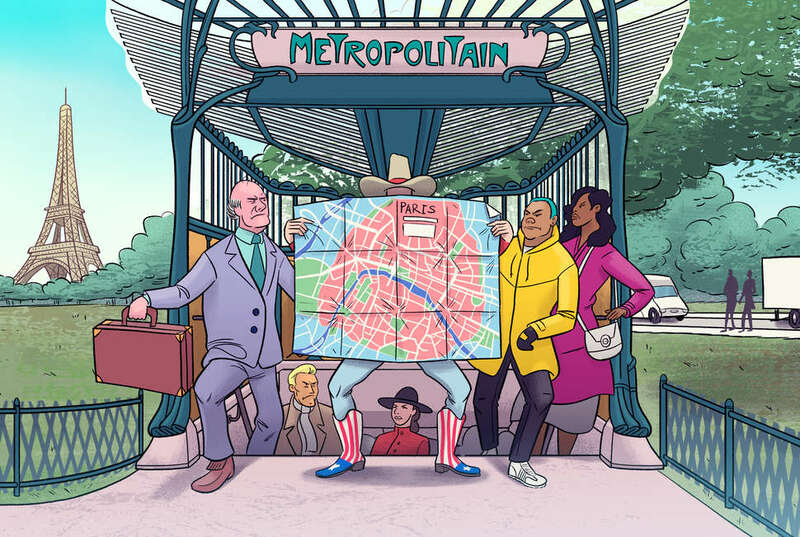 It’s probably the Parisians’ fault -- even other French people think Parisians are smarmy. But Parisians have places to be and people to see; you can’t really blame them for getting impatient when there’s a clueless tourist in their way. To that end, there are quite a few guidelines for an American to keep in mind when traveling through France so as not to inadvertently offend, or be offended by, the locals. And even if we do occasionally fly into a passionate, wildly gesticulated rant at the slightest inconvenience, try not to take it too hard. That’s just kind of how we are. Here’s how to handle the French like a pro. The French consider themselves open, frank, and always up for a challenge. The first response to a request is often an emphatic ‘Non!’ -- but don’t back down! Try to see this kind of quirky rudeness as a challenge. ‘Non!’ can actually mean: “Convince me there’s a good reason for your request, and I’ll consider it.” So if you’re offered a restaurant table near the door and you’d rather sit somewhere warmer, make some cheerful but dramatic gestures to indicate you’re cold and your wish may be granted. Play along and embrace the eccentricity. If you find yourself at a train station, airport, market, or anywhere else you might expect people to form a line, you’ll instantly notice that waiting your turn isn’t the done thing in France. If there were an Olympic event in line-jumping, the French would win gold. People would push past their own grandmother just to be first on a bus -- if she wasn’t already pushing past them. Curiously, once everyone’s on the bus, people become more civilized and start offering seats to those who need them. Impatient New Yorkers take note: sales assistants won’t approach you in a store like they would in America. This might seem like bad customer service, but they’re actually just giving you space to browse. Taking your time is an important part of French culture -- we believe that anything worth doing should be done well and thoughtfully. In a restaurant, the server will give you plenty of time to look over the menu (just be sure to close it when you’re ready to order, or they will NEVER come). French servers won’t shoo you out as soon as you’ve finished your coffee, either; you can relax and enjoy yourself after you’ve finished the meal. An exception to this rule might be Paris, which is more fast-paced and everyone has somewhere they needed to be, like, ten minutes ago. Outside of Paris, though, the pace is much slower; the further south you go, the less punctual people are, and the less they’ll appreciate being hurried. When in France, speak French. At least make an effort at the beginning of a conversation, even if it’s just a few basic phrases. Many French people will put you out of your misery and switch to English right away. Err on the formal side, as well; always greet people with a polite “Bonjour Madame/Monsieur” (or “Bonsoir” in the evening). This includes servers, sales assistants, tour guides, and hotel staff. You’ll probably get better service. The one thing not to say in French is the ‘Voulez-vous…?’ question from All Saints’ “Lady Marmalade” song. It’s not that French people don’t have a sense of humor, it’s just that that joke stopped being funny in France (and uh, everywhere else) a long time ago. Imagine if someone approached you in your hometown and started speaking rapidly in French. You’d be confused… and depending on your hometown maybe even a little alarmed. Now put yourself in French people’s shoes. Their English may seem awesome compared to your French, but they might not understand your accent or way of saying things. Most French people learn British English at school and won’t know typical American expressions. The best approach? Speak slowly, and simply. Or if you want to use this opportunity to practice your best British impression, give that a go. In France, a comfortable silence is far preferable to mindless chit-chat. This can seem awkward to small-talking foreigners. It’s not that we’re unfriendly, we’re just private and formal with people we don’t know. Whatever you do, don’t ask someone you just met questions about their personal life, like their careers, family, or even what they did last weekend. You’re just making polite conversation, but French people will clam up if they feel like you’re getting too personal too soon. Stick to current events, sports, the arts, and food. As for politics… well, the French love a good debate; they’re just not sure what to say about American politics right now. In the States it’s generally acceptable to ask for no onions and cheddar instead of mozzarella. This is a big no-no in France, unless you have an allergy. Furthermore, if you ask for a bag or box for your leftovers, expect eyebrows to be raised. Most restaurants in France are all about quality over quantity, so in their mind the portions (which are much smaller than in the US) are just enough. Only ask for a box if you see servers offering them to other customers. Unless you’re in a Starbucks, it’s not cool to ask for a coffee to go. Remember, doing it the French way means taking your time. You’re not in a hurry -- you’re on vacation! Take a seat on the terrace and do some people watching while you enjoy your joe. In restaurants, the service charge is always included in the bill. But if your server gave you great service (and didn’t make you feel bad for customizing your order) leave some extra change. Waiters are paid the minimum wage, so they really appreciate tips. Don’t worry about how much to leave -- the gesture is more important than the amount itself. You don’t have to tip taxi drivers in France, but again, it’s appreciated for great service. Tipping a tour guide, though, is a must. For a group tour, tip 5€ to 20€, depending on the length and quality of the tour. If you’re invited over to someone’s house for dinner, arrive up to fifteen minutes late and don’t bring a bottle of wine -- it’s like saying your host’s wine isn’t good enough. Always wait till the host says ‘Bon appétit!’ before digging in. And finally, when you’ve had enough wine, leave your glass full or they’ll keep topping it off. The French can’t bear to see an empty wine glass. Americans tend to keep doors open at home, but the French keep most doors in their house closed. A closed door marks a boundary between a person’s private and social life, so unless you know a person very well, it’s best to stay in the rooms with open doors. The only exception is the bathroom; this is a closed door you can open, and should never leave even slightly open when you leave. Always close the bathroom door after you in France. Raucous after-dinner debates are deeply ingrained in French culture. When 17th century philosopher René Descartes stated that to get to the truth of a matter you have to look at both sides of an argument, the French really took it to heart. They’ll even argue points they don’t agree with, just to spice things up a bit. Foreigners might find their persistence and dramatic gestures annoying or even aggressive, but we rarely mean it that way – we’re just having a good time. It’s very common to ‘faire la bise’ in France, i.e. kiss people when greeting, thanking, or saying goodbye to them. This French tradition raises all kinds of questions for foreigners: are your lips supposed to touch their cheek or not? Exactly how many kisses do you give? And what on earth do you do with your hands? At a party, you can end up kissing a bunch of people you’re meeting for the first time and not even know anyone’s name by the end of it. So, what to do? Your safest bet is to follow the French person’s lead. Most people kiss once on each cheek, and the lips may or may not touch the skin. That’s fine – it’s the gesture that counts. And as long as you remember your Bonjour Madame’s and Merci beaucoup’s, you’ll be off to a great start. Émilie Thyebaut is a tour agent and travel writer. She and her husband Guillaume run France Just For You, a small self-drive tour company, from their home in the Loire Valley. They take pride in sending their travelers off-the-beaten track to discover France's hidden beauty spots.